All transactions are safe and secure with a reliable history in online purchasing behind each of our associates. 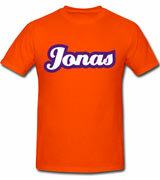 Buy the Jonas t-shirt to own Jonas Brothers clothing and merchandise. If you're a fan of the Jonas Brothers band, then you've most likely watched Joe Jonas' "Single Ladies" video where he dances in a spandex costume, imitating Beyoncé Knowles from her music video of the same name. These Jonas Brothers shirts will remind everyone to not be afraid or embarrassed to express themselves or even act a little goofy once in a while, just like they do. We agree that Joe may have taken things a bit too far. In addition to the Jonas tee above, browse the Jonas Brothers Clothing Gallery for more apparel like men's and women's clothes, kids shirts or hoodies.